Please fill out the form below to download the PlumeStop Technical Bulletin. In recent years, remediation professionals have faced protracted timeframes and increased costs associated with groundwater contamination at complex sites. The National Research Council (NRC) has identified back diffusion (also known as matrix back diffusion) as one of the prominent processes that limit our ability to clean up groundwater at such sites. There is clearly a need for techniques that address groundwater contamination associated with matrix back diffusion and thus allow faster and lower-cost cleanup of contaminated sites. 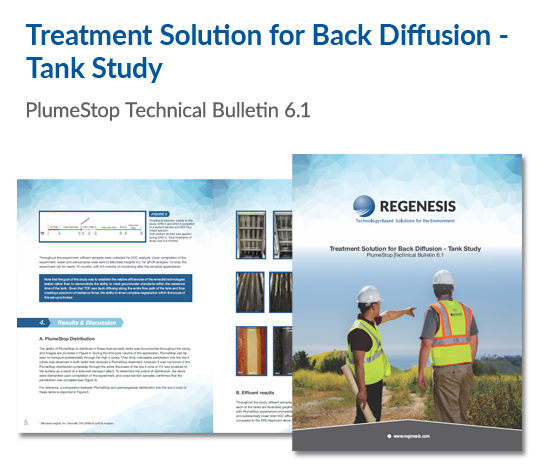 This technical bulletin demonstrates that PlumeStop® Liquid Activated Carbon™ is the solution to this problem.